Undoubtedly, bags under eyes is one of the biggest issues that men and women face. They not only show a person’s age, but they also show all kinds of stress. The result becomes visible in the form of bags and dark circles. But … do you know what to do with those bags under eyes? What causes them, and how do bags and dark circles differ from each other? Although both are located in the outline of the eyes, bags under eyes and dark circles are very different. Bags are produced when liquids and toxins accumulate in the lower eyelid area. The tricks to combat the bags are aimed at deflating the area as quickly as possible. In contrast, the dark circles are caused by the increase of the pigmentation on that level of the skin. The appearance is completely different, and so are the solutions to treat them. However, some tricks for bags may also be good for dark circles. What to do in removing bags under eyes? There are some very advanced aesthetic treatments available. 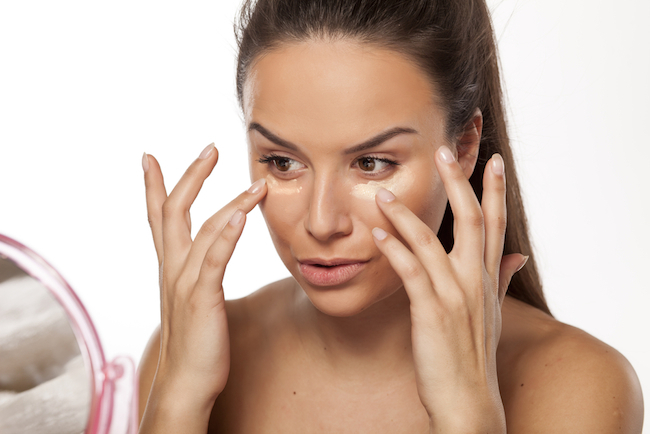 Thankfully, there are some DIY tricks which can also be used to remove the eye bags. Making compresses with cold sachets of green, black, or chamomile tea will help your eyes relax. Also, the anti-inflammatory properties of the teas will make the bags disappear. To do this, place cool water in a cup and dip two tea bags into it . Drain and remove. Then lie down with your eyes closed. Place the tea bags on them, and leave them until they reach a normal temperature. When this happens, wet them again with cold water and repeat. You can repeat the procedure for half an hour. Sometimes, all you require is a little cold water, since the bags are usually formed by poor circulation in the face.Wash your face using cold water while applying a little extra pressure and a massaging motion. This will cause the swelling to subside within minutes. Another remedy is to wet a clean cloth with cold water and place it under and around the eyes, applying very light pressure. This vegetable helps to drain the liquid from the bags under the eyes. It is also very effective when they appear due to allergies. Its astringent properties make the blood vessels constrict, which relieves inflammation. To do this, lie back and place a slice of cucumber on each eye. Let them rest on your eyelids for up to 15 minutes. With your fingertips, you can gently tap the bags under your eyes. This will help drain the liquid. Be careful not to exert excess pressure. Alternatively, close your eyes and lightly press with the ring finger on the area below the eye. Move your finger in an arc pattern from the inside to the outside. Repeat the movement 10 or 15 times, always taking care not to press down too much. Then, go ahead and do same on the other eye. Give these massages every morning before you get out of bed. When your body does not access the required amount of water it needs, it accumulates it in different areas. This same thing can happen around the eyes. Drink plenty of fluids during the day to avoid swelling. Water will also help reduce the effects of your daily consumption of salt. Incorporate foods in your diet like watermelon, grapes, and cucumber which contain a lot of water. Since inadequate sleep is one of the factors that contribute to the formation of bags under the eyes, it is important that you sleep between 7 and 8 hours per night. Resting with a slightly raised head will also prevent the bags from appearing by preventing the fluid from accumulating in the area. Essentially, having bags under the eyes makes the face look tired and old. Luckily, the natural options highlighted above can help you remove the bags within a short time. Although they are quick treatments, they do not make your results less effective.